Accesa was honored to host a delegation under the guidance of Varujan Pambuccian, one of the deputies activating in the Committee on Information and Communication Technology in the Romanian Chamber of Deputies. The event took place on 21st November and was part of the IT Caravan: The Future of IT in Romania (Caravana informaticii) organized by PIN Magazine and Griffiths School of Management. It aimed to create the opportunity for an open discussion between IT specialists and officials who are involved in the development of this sector. 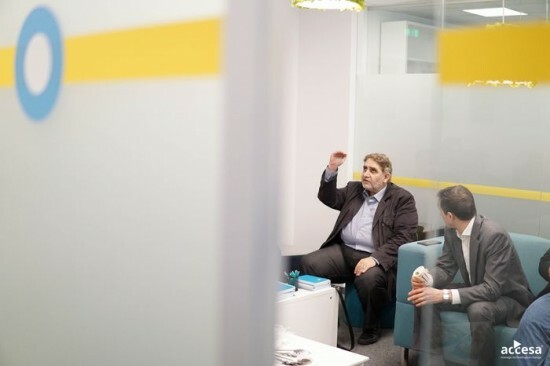 The visit started with a guided office tour which gave Varujan Pambuccian an insight on Accesa’s competence centers, our expertise and how we help organizations thrive in the new digital business era. The second part of the delegation aimed to create the opportunity for an open discussion between our colleagues and the officials visiting. Varujan Pambuccian insisted on the importance of taking the challenge of innovation in this domain and on how important creating IT hubs is, in order to encourage the creative spirit of IT in Romania. Our colleagues had the chance to raise questions, debate upon the challenges encountered over the years and express their views regarding the future of IT. We thank the delegation for being selected to be one among the 25 companies visited and appreciate Varujan Pambuccian’s openness in taking the pulse of the IT community.